We have been working with Luke since he was about 5 months old on baby sign language. Obviously, the purpose of using sign language with your baby is to be able to communicate better with them before they are able to verbalize. 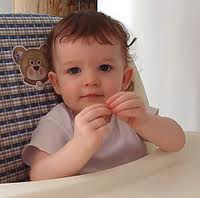 Research also shows that babies that do baby sign language get a great start in life – with bigger vocabularies and more advanced cognitive skills even years after they have stopped signing. Some of the signs we have been working with Luke on is "more," "all done," "eat," "milk," "hello," and "goodbye." Again, the purpose of using sign language is so that Luke can communicate to us his needs, desires, etc. Well, I guess it doesn't really matter what the sign is, as long as it is something we understand, right? Too funny!! He knows when he wants more food!